Release Date: March 10th, 2006 (Quad Cinema) by International Film Circuit. Directed by Hank Rogerson and Jilann Spitzmiller. BASIC PREMISE: A documentary about twenty inmates who perform Shakespeare’s “The Tempest” in a Kentucky prison. 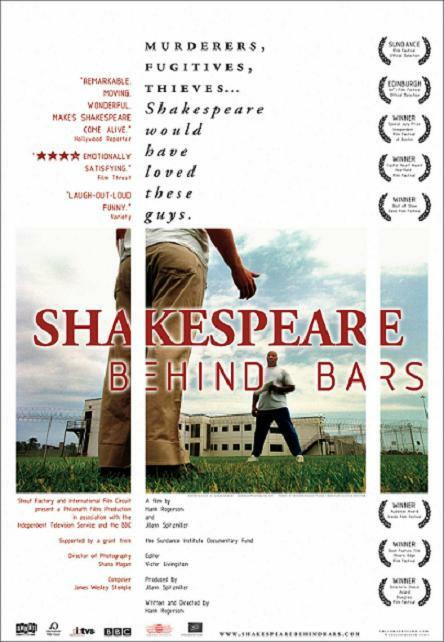 ENTERTAINMENT VALUE: What makes Shakespeare Behind Bars such a unique documentary is that it takes the image of prison, a stereotypically bleak environment, and transforms it into a lively, warm place where art flourishes. It helps that the inmates belong to Luther Luckett Correctional Complex, where they have time and resources to be in a play to begin with. Curt, one of the inmates, volunteers as the director along with his large troupe of surprisingly eager thespians. Rather than just focusing on the tedious production of the play, directors Hank Rogerson and Jilann Spitzmiller wisely humanize the felons as well. For example, Hal, who plays Prospero, describes in detail exactly what went on in his mind before he murdered his wife. Another inmate shows indolence and stubbornness which briefly hinders the progression of rehearsals until he gets lectured by Curt and factors painful events from his life into his role. Meanwhile, Red fearlessly volunteers to play the role of Prospero’s daughter Miranda, which allows him to get in touch with his feminine side. Amazingly, this is the seventh year that the theater group has been in performing Shakespeare plays. It would have been interesting to know exactly how the group formed to begin with. However, at least you end up caring about these inmates because the filmmakers treat them with unflinching respect in every scene. During the actual show, you hope that everything will go well after all of the amazing artistic effort and energy—someone even volunteers to paint the background scenery. Fortunately, Shakespeare Behind Bars doesn’t simply end when the play is over. After all, the thespians that make up the show are the most important part of this documentary. It’s not only engaging, but also a powerful experience to observe how their involvement in this special theater group has changed them on the inside forever. SPIRITUAL VALUE: Each inmate has a certain degree pent-up anger, rage, frustration and regret. When they participate in Shakespearean plays such as “The Tempest”, they channel their negative energy into something more constructive and cathartic—and thus therapeutic. One of the inmates channels his anger toward Hal as if he were his real father. The therapy goes beyond the show when directors Hank Rogerson and Jilann Spitzmiller focus the camera on them individually to listen to them confess their crimes and express remorse. These are the most touching and heartbreaking scenes in the film. The emotional impact resonates long after the end credits roll. IN A NUTSHELL: A lively and warm documentary full of profoundly emotional and insightful moments!